Connie Hart showed us this bonnet that her Grandmother made for her Dad, Earl Deen. It's over 100 years old.....He was born June 11, 1913. Doris tested a new pattern, Scrappy Star, for a friend. She made the quilt, placements, hot pads, oven mitt, a kitchen valance and towels in retro colors. Millie Schwab made a this "Star Sampler" for some friends. She backed it with pretty fabric and the quilt is made even more special with one of her beautiful quilt labels. 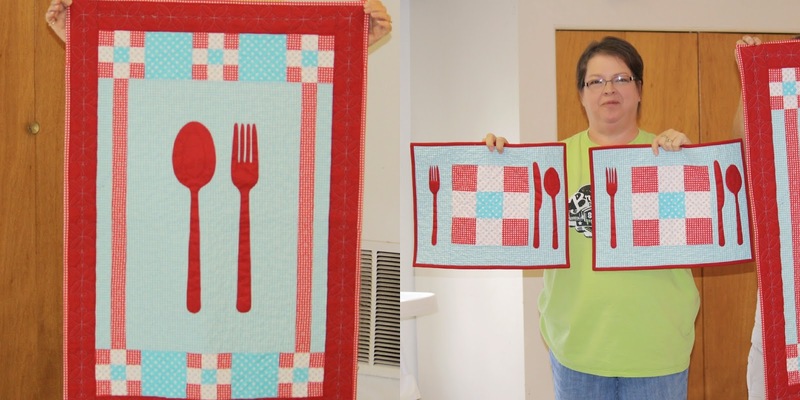 Nancy Tubb shows us the table topper she made for her kitchen. She says everyone knows to remove it BEFORE you sit down to eat ! 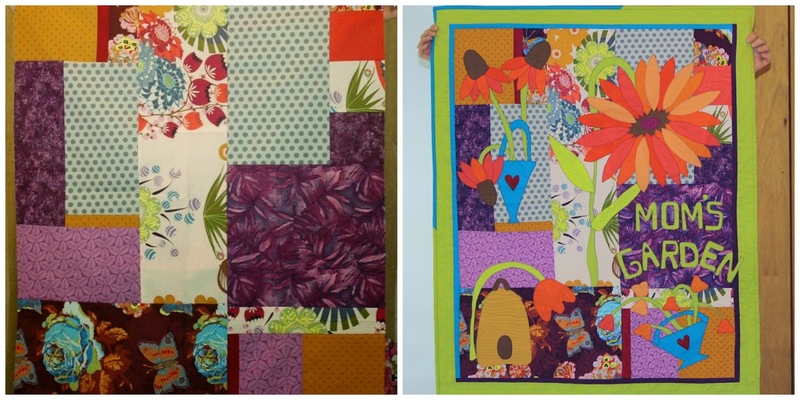 The State of Texas is a paper pieced wall hanging she made in a Cynthia England class. Her quilt is a Texas panel, she proudly uses in her "Texas" home..
to support the womens ministry at her church. 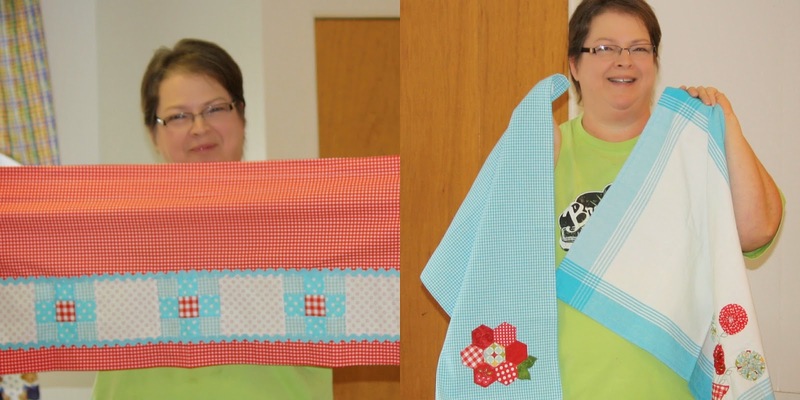 Vickie Mazurek shows the completed wall hanging she made for her Mother, in a Pat Sloan workshop she attended with members of the Abilene Quilt Guild. 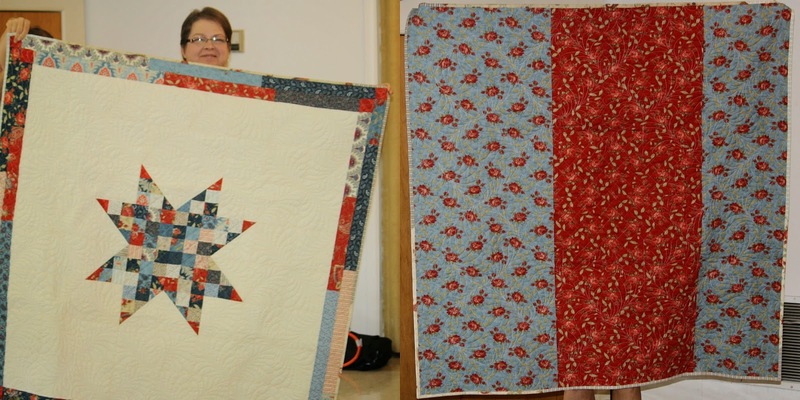 This is Vickie's "Vintage Stars" quilt she made to test a pattern for a friend. You can read about and see more pictures HERE. Joy Ivy shares a wreathe her sister made her for her sewing room. Joy also shared a folder full of goodies she received from a friend. It contained things like a "Woman's Day" pattern from 1961, a butterfly quilt pattern by Laura Wheeler Designs, a"White" sewing machine leaflet with instructions how to make curtains and slip covers, and a leaflet on how to do applique from TG&Y, priced at 39 cents. who do many nice things for her, called "Blooming Bricks". The Comanche County, Texas Historical Museum contacted the Brownwood Quilt Guild, asking us to have a look at this 1934 Friendship quilt. We discussed ways to preserve or restore it. It's an "Improved Nine Patch" that had 49 blocks in it at one time. 47 of which had the friends names on the blocks.It was quilted by the Harmony Good Will Club in 1934.